In large bowl, beat cream cheese, sour cream, 1/4 cup radishes, the onions, cucumber, bell pepper, sugar, salt, dill and pepper with electric mixer on low speed about 1 minute or until well blended. Spoon into 1-quart serving bowl. For garnish, cut 5 small, thin oval slices from radish to look like red fingernails. Use small amount of dip to attach "fingernails" to small ends of carrots. Arrange carrots in dip to look like hand emerging from dip. Slip plastic ring onto "ring finger." 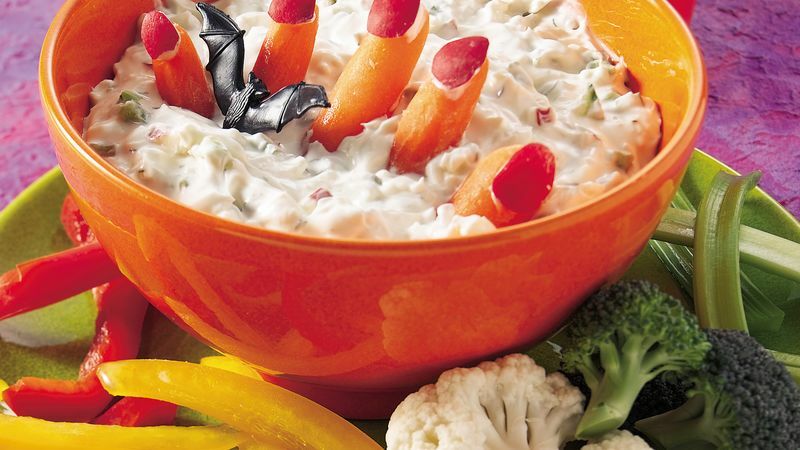 Serve dip with cut-up vegetables. Store in refrigerator. After using the vegetables you need for the dip, cut the remaining veggies to serve with the dip. Or pick up the small amount of veggies you need at the salad bar in the deli section of your grocery store.